Different kinds of bioactive materials are used as bone substitutes. In particular, bioglasses containing Si, Ca, Na and O, bind to host tissues with a stable chemical bond. The phenomenon of bioactivity is associated with the formation of a crystallized hydroxycarbonated apatite (HCA) layer on the bioglass surface when soaked in a simulated physiological fluid. This layer is similar to the mineral phase of bone. However, they do not have sufficient strength for use in load-bearing situations and therefore improving their mechanical properties would allow their use in more robust applications. Within the previously studies, we have shown that the density, glass transition temperature, hardness and elastic modulus have increased linearly with nitrogen content. The purpose of this work was to study the effects of nitrogen addition on the bioactivity in a simulated body fluid (SBF) and cytotoxicity tests have complemented the study. Bioglasses are materials able to develop a Hydroxy Carbonate Apatite layer (HCA) at their surface when soaked in a body fluid [1-4]. The formation of this layer is believed to be, with a satisfactory osteoblast interaction, an essential condition for bonding to the living bone . Moreover, HCA permits a stable and durable anchoring between implant and host environment. Thus, this kind of glasses has been developed during the past few decades in repairing surgery in order to adjust, replace or increase the parts of the skeletal system [6-8]. Several mechanisms have been proposed to explain the bioactive behavior of glasses and glass–ceramics [7-13]. Hench et al. proposed the most widely accepted mechanism [7-10]. Hench is the first researcher having prepared a bioactive glass. His composition, called Bioglass 45S5, contains 46.1% of SiO2, 26.9% of CaO, 24.4% of Na2O and 2.6% of P2O5 in mol percent. Up to now, this glass is a reference; it is the most known and used by authors [7-10,14]. Since its discovery, a lot of elements have been added to the 45S5 composition, for example, CaF2, B2O5, Al2O3, MgO, K2O...etc. . In these conditions, it is difficult to know the influence of each component in an exact way. First, it is necessary to study glasses of the simple system SiO2–CaO–Na2O. However, the low mechanical strength and inherent brittleness of these bioglasses have restricted their use to non-load-bearing applications  such as ossicles in the middle ear. The incorporation of nitrogen into the silicate network has been proposed as solution to resolve the problem of low strength in glasses [16,17]. In the current work, we decided to extend our data previously published  with the effect study of adding nitrogen on bioactivity and cytotoxicity of bioglasses. The bioactivity of the glasses has been evaluated by soaking them in simulated body fluid (SBF) . The changes at the glass surface as a function of soaking time in the SBF was analyzed by X-ray diffraction (XRD). The cytotoxicity has also been studied with L132 epithelial cell line to assess the ability of the bioglasses for bone reconstruction. Cytotoxicity tests based on different concentrations of bioglass powders in a cell growth environment have been also evaluated. Oxynitridebioglasses of molar composition (55−3x)SiO2– 13.5CaO–31.5Na2O–xSi3N4 (x is the no. of moles of Si3N4) were prepared by melting the glasses in two steps. Glasses were prepared from reagent grade SiO2 (pure quartz, Merck), CaCO3 (Chimie-Plus-Laboratoire, 99%), Na2CO3 (Merck, purity 99.9%) and Si3N4 (UBE, industries, minimum purity 98%). The weight of each reagent has been calculated taking into account their purity. The glasses were designed so that constant cation ratios could be maintained independently of nitrogen additions. Thus, the N:O ratio is the only composition variable which changes. The effects of cation ratio variations on glass structure and properties are eliminated. The compositions of the glasses are shown in Table 1. Base glasses were prepared by reacting and melting Na2CO3 and CaCO3 with SiO2 in a platinum crucible at 1450 °C in air. After this melting process, these oxide glasses were milled to a powder. The corresponding amount of Si3N4 to achieve the required composition was added to the glass powders taking into account the surface silica on the silicon nitride particles which were then milled in isopropanol in a ball mill with alumina media for 3 h and then the alcohol was evaporated. The powders were then pressed uniaxially under a pressure of 300 MPa to form pellets. The pellets were then placed in a BN lined graphite crucible and melted in a vertical tube furnace under flowing high purity N2 at 1400°C for 15 to 30 min. The glasses obtained were then annealed, at a temperature just below their glass transition temperature for 1 h, to stabilize the glass by eliminating stresses created by rapid cooling. Weights before and after melting were measured. The nitrogen concentrations retained in the glasses shown in Table 1, were determined by electron microprobe analysis using wavelength dispersive spectroscopy (WDS. The Si, Ca, Na and O relative contents were measured using scanning electron microscopy coupled with energy dispersive spectroscopy (SEM–EDS) with a Noran System Six-type. All glasses were also embedded into an epoxy resin and then polished with silicon carbide papers, graded from 80 to 1200. This provides a flat surface and easily analyzed by EDS, the analyzed area being about 1 μm3. Table 1. Weight percentages of elements in prepared Na–Ca–Si–O–N bioglasses (T — Theoretical; E — Experimental). The nitrogen concentrations retained in the glasses, shown in Table 1, were determined by electron probe microanalysis (EPMA) (Cameca SX100 electron probe microanalyser) using wavelength dispersive spectroscopy (WDS). All samples were embedded in an epoxy resin and then polished using SiC papers down to 0.25 μm to provide a completely flat surface. Quantification of nitrogen was carried out at 15 kV, 200 nA. A PC2 (Ni/C) crystal was used to detect the Kα X-rays. The standard used for N quantification was BN. For each glass, 10 measurements were performed to evaluate the nitrogen homogeneity and to calculate the average nitrogen content in the glasses. The background noise used for the calculation of the N Kα peak height on the glass samples was measured on a glass without N. The Si, Ca, Na and O relative contents were measured on similar prepared embedded polished samples using scanning electron microscopy coupled with energy dispersive spectroscopy (SEM–EDS) (Noran System Six-type), the analyzed area being about 1 μm3. Samples were analyzed using X-ray diffraction (Pan Alytical X-ray diffractometer, Netherlands) with monochromated CuKα (λ=1.54056 Å) radiation over a range of 2θ of 20º–80º with a speed of 2.4°/min. The present analysis allows us to verify if there are any crystalline phases exist, and the indexation of X-ray patterns was performed by using X'pert Quantify software. Glass cylinders of dimensions 15 mm in diameter and 3 mm in height were polished with (2400 grit) silicon carbide coated paper. The polished glass pieces were ultrasonically cleaned in an isopropanol anhydrous bath. In vitro bioactivity tests were carried out on the dried glass plates by soaking them in simulated body fluid (SBF). SBF with ion concentration almost equal to that of human blood plasma was prepared by a procedure established by Kokubo et al. . Accordingly, reagent grade NaCl, NaHCO3, KCl, K2HPO4.3H2O, MgCl2.6H2O, CaCl2 and Na2SO4 were dissolved in ion exchanged water and the resulting solution was buffered at a pH of 7.42 with 50 mM (tris-hydroxymethyl)-aminomethane and 45 mM hydrochloric acid. The temperature of the solution was maintained at 37°C throughout the experiment to simulate a human physiological environment. Glasses immersed in SBF were taken out after 15 days, gently rinsed in ion exchanged water and stored in a vacuum desiccator. Structural changes on the surface of the samples treated in SBF were analyzed using grazing incidence XRD and SEM coupled with EDS spectroscopy. Cytotoxicity tests consist of viability tests which evaluate the relative plating efficiency (RPE) and subsequently the 50% lethal concentration LC50 (or RPE 50) by means of thecolony-forming assay with epithelial cell line (L132 cells) . According to the International and European Standards (ISO10993-5/EN30993-5), the L132 epithelial cell line is selected for its good reproducibility and cloning efficiency (about 37%) . In minimum essential medium (MEM) supplemented with 10% foetal calf serum (FCS), the L132 cells are continuously exposed to gradually increasing concentrations (0, 25, 50,100, 200, 400 mg L-1) of bioglass powder (20 μm diameter granules) without renewal of the growth environment during the experiments. The positive control is pure nickel powder; the average particle size is 4-6 μm. After a 9-day culture period, the environment is removed and the colonies are stained with violet crystal. The number of colonies is then counted under a binocular microscope. At least six repeated experiments are performed, in triplicate for each concentration group. Results are expressed as mean values ± SD with respect to the control (an environment without glass powder, 100%). Nickel powder is also tested as a positive control for comparison. Figure 1 shows the XRD analysis of the four quaternary glasses. The obtained results confirmed that all the glasses are totally amorphous. Figure 1: X-ray diffractograms of the G1Nx glasses. As shown in Figure 2, all the glasses containing nitrogen gray in color. It was observed that the color of the glass is darker when the amount of nitrogen increases. The calculated and analyzed Si, Ca, Na and N contents of glasses are shown in Table 1. It can be seen that nitrogen and sodium are lost from the glasses during melting and this may be attributed to volatilization of Na3N . This also results in the formation of bubbles in the glass which is more noticeable as nitrogen content increases. Moreover, no significant Ca or Si losses were observed. 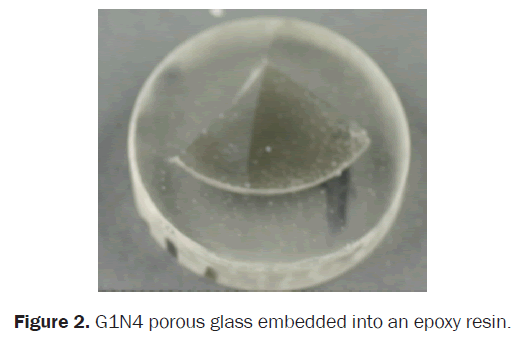 Figure 2: G1N4 porous glass embedded into an epoxy resin. 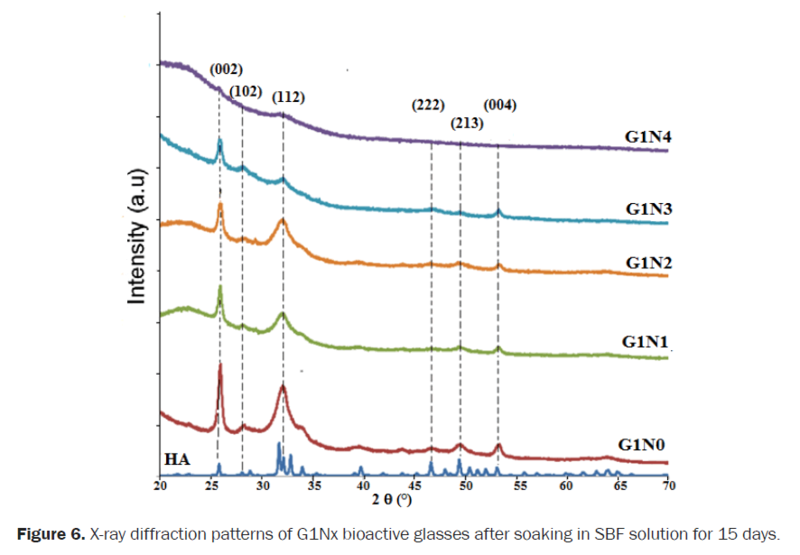 The changes in the infrared spectra of natural hydroxyapatite and the surface of G1N2 bioglass have been demonstrated after different soaking times in SBF: 3 h, 6 h, 9 h and 12 h as illustrated in the Figure 3. After 6 h of soaking in SBF, the glass network hydrolysis begins. Indeed, it is seen on the spectrum with the appearance of the asymmetrical stretching vibration band of νas Si—O4 BO (bridging oxygen) intra-tetrahedra at 1068 cm-1 and the reduction of the stretching vibration of Si—02 NBO at 928 cm-1. This is due to the dissolution of the glass by formation of Si—OH groups which have the ability to recondense to form a silica gel. In fact, The given data is characterized by the symmetric stretching vibration band of νas Si—O tetra at 790 cm-1. There is also a narrowing of the bending band δ Si—0—Si at 499 cm-1 and the presence of the stretching vibration band of Si—OH (νSi—OH) at 961 cm-1, confirming the existence of the silica gel. The amorphous CaP layer also grows and its formation can be observed by the presence of the stretching vibration band of P-0 (ν P=0) at 1229 cm-1 and the bending vibration band of PO4 antisymmetric O—P—O (δas O—P—0 amorphous) at 560 cm-1. Figure 3: Infrared spectra of bioglass G1N2 surface after different soaking times in SBF. The apatite phase growth continues after 9 and 12 h. The present glass which develops an HCA layer on its surface is called bioactive. The response to SBF of the glass Si-Ca-Na-O-N systems was studied. Figure 4 presents the surface of G1N0 and G1N3 glasses after soaking for 4 weeks in SBF. It appears that a considerable amount of apatite has been deposited on the surface of the samples as confirmed by EDX analysis which shows only Ca and P peaks as seen in Figure 5. Apatite deposition on the surface of these glasses may be due to the presence of Ca-rich crystalline phases and a change in the chemistry of the residual glass which becomes Na-poor and Si-rich when the content of nitrogen increases. Na ions are incorporated in the crystalline phases and therefore have less influence in the surface reaction kinetics of the material which influences bioactivity. Calcium release should be enhanced by the presence of Ca-rich phases such as cuspidine and high levels of Si in the residual glass may also increase Si release providing nucleation sites for apatite deposition. Figure 4: SEM micrograph of the: G1N0 and G1N3 glasses surface after soaking in SBF. Figure 5: EDS spectra and micrographs of G1Nx bioactive glasses before and after 15 days soaking in SBF solution. The essential condition for a biomaterial to bond with living bone is to develop its surface in the body fluid environment of an apatite layer. In Figure 5, SEM micrographs show the surfaces of the G1Nx bioactive glass series before and after 15 days in SBF solution. Following immersion, a crystalline layer is apparent on the surface of glasses and EDS analysis confirms the presence of Ca and P with Ca:P ratios of (a) 1.64 (G1N3) and (b) 1.72 (G1N1). These values are in accordance with the theoretical value of 1.67 for hydroxyapatite. The precipitated calcium phosphate crystals have a diameter of about 200–300 nm on both the base oxide and oxynitride glass surfaces. The morphology of this formed layer is homogeneous. The XRD patterns of the glasses before immersion in SBF solution are characterized by an amorphous halo confirming that all the glasses were amorphous. The XRD patterns obtained from all G1Nx samples after immersion in SBF for 15 days are presented in Figure 6. The natural hydroxyapatite pattern is used as a reference (JCPDS pattern no. 90432) and also for comparison. It shows that on all the glass samples, a hydroxyapatite layer is formed, confirmed by the three strongest XRD peaks appeared at 2θ of 26.30, 32.27 and 53.15° that correspond, respectively, to the (002), (112) and (004) planes. However, the intensities of the major peaks (002) and (112) decrease with nitrogen content showing that the crystallinity of this layer consistently decreases with its content, suggesting that nitrogen may inhibit bioactivity. Figure 6: X-ray diffraction patterns of G1Nx bioactive glasses after soaking in SBF solution for 15 days. The mechanism of apatite deposition on the surface of Na2O-CaO-SiO2 glasses in the simulated body fluid has been reported by Ohtsuki et al. . When these materials are exposed to SBF for a period of time, Ca and Si ions are released and silanol groups (Si-OH) form on the surface of the material. The silanols act as heterogeneous sites for the nucleation of apatite and hence Si dissolution is important for the kinetics of these reactions. Released calcium ions supersaturate the SBF solution and react with phosphate ions in the vicinity of the surface and apatite nuclei form and grow over time as the SBF is rich in apatite ions (Ca and P). Thus, both Ca and Si release have significant importance for the later apatite deposition . Also the reason for decrease of the bioactivity with nitrogen content can be attributed to the fact that initially the base oxide glasses were not chemically active materials and nitrogen addition, which improves the glass network connectivity and chemical durability of these glasses, reduces their chemical reactivity with the environment even more. Bioactive glasses usually have higher amounts of network modifiers and lower amounts of network formers when compared with normal glasses, giving them a disrupted network which can react more easily with the environment . Figure 7 shows the results of viability tests, performed on samples of G1Nx and nickel powder as a function of powder concentration. The viability percentage is determined by the ratio between the number of surviving L132 cells in the medium exposed to the powder sample and the number of surviving cells in a control medium. LC 50 corresponds to the death of 50% of the cells. The number of introduced cells is the same in all the samples and the control. It is necessary to compare with the control because the survival ratio is never really 100%. Indeed, the cells are stressed during the subculture which leads to the death of a small fraction. Figure 7: L132 viability tests on G1Nx and nickel. A compound will be considered cytotoxic if its addition into the culture medium increases the cell death as the compound concentration increases. In the present case, bioglasses G1Nx do not show this behavior. With a concentration of 400 mg L-1 the average survival of L132 cells is 100% for G1Nx. Thus, neither of the glasses are cytotoxic. It is interesting to note that both bioglasses show a higher survival ratio than 100% at low concentrations (112% for G1N0 and 105% for G1N4 with 25 ml L-1). This result shows that the bioglasses improve growth conditions for cells which might reduce the stress on the L132 cells. The objective of this work was to determine the effects of nitrogen addition on the Bioactivity and Cytotoxicity of oxynitride bioglasses with constant cation ratios and changing O:N ratio (molar composition (55−3x)SiO2–13.5CaO–31.5Na2O–xSi3N4) .The study of bioactivity revealed in vitro tests, by soaking in SBF at 37 °C, that the all glasses GNx are bioactives. Cytotoxicity tests show that they are not cytotoxic. Bachar A, et al. Effects of addition of nitrogen on bioglass properties and structure. J Non-Crystalline Solids 2012;358:693-701. Hench LL. Bioceramics: From Concept to Clinic. J Am Ceram Soc 1991;7. Hench LL. Bioceramics. J Am Ceram Soc 1998. Kokubo T. Surface chemistry of bioactive glass-ceramics. J Non-Crystalline Solids 1990;120:138-151. Kim FMH and Kokubo T. Bioactivity of Na2O–CaO–SiO2 glasses J Am Ceram Soc 1995;78:2405. Ducheyne P. Stimulation of Biological Function with Bioactive Glass. MRS Bull 1998;23:43-49. Cao LLHW. Bioactive Materials. Ceram Int 1996;22:493. LL Hench. Handbook of Bioactive Ceramics 1990;1. Kim CY, et al. Early stages of calcium-phosphate layer formation in bioglasses. J Non-Crystalline Solids 1989;113:195-202. Rehman I, et al. Analysis of surface layers on bioactive glasses. Biomater 1994;15:865-870. Ohtsuki C, et al. Mechanism of apatite formation on CaOSiO2P2O5 glasses in a simulated body fluid. J Non-Crystalline Solids 1992;143:84-92. Andersson ÖH, et al. Calcium phosphate formation at the surface of bioactive glass in vivo. J Non-Crystalline Solids 1990;119:290-296. Andersson ÖH, et al. In vivo behaviour of glasses in the SiO2-Na2O-CaO-P2O5-Al2O3-B2O3 system. J Mater Sci Mater Med 1990;1:219-227. Lebecq I, et al. Compositional dependence on the in vitro bioactivity of invert or conventional bioglasses in the Si‐Ca‐Na‐P system. J Biomed Mater Res Part A 2007;83A:156-168. Brink TTM, et al. Quantitative comparison of bone growth behavior in granules of Bioglass©, A-W glass-ceramic, and hydroxyapatite. J Biomed Mater Res 1997;51:37-46. Hampshire S. Oxynitride glasses. J Eur Ceram Soc 2008;28:1475-1483. Bachar A, et al. Effect of nitrogen on properties of Na2O–CaO–SrO–ZnO–SiO2 glasses. J Am Ceram Soc 2015;98:748-757. Siqueira RL, et al. Gel-derived SiO2–CaO–Na2O–P2O5 bioactive powders: Synthesis and in vitro bioactivity. Mater Sci Eng: C 2011;31:983-991. Frazier ME and Andrews TK. In: Kharash N (Ed.) Trace Metals in Health and Disease. Raven Press, New York. In vitro clonal growth assay for evaluating toxicity of metal salts 1979;71-81. Hornez JC, et al. Multiple parameter cytotoxicity index on dental alloys and pure metals. Biomolecular Eng 2002;19:103-117. Ohashi M and Hampshire S. Formation of Ce‐Si‐O‐N Glasses. J Am Ceram Soc 1991;74:2018-2020. Vallet-Regí MDT. Revisiting ceramics for medical applications. Dalton Transactions 2006;5211-5220. Arstila H, et al. Factors affecting crystallization of bioactive glasses. J Eur Ceram Soc 2007;27:1543-1546.